Sony’s VENOM, starring Tom Hardy, is now in theaters. 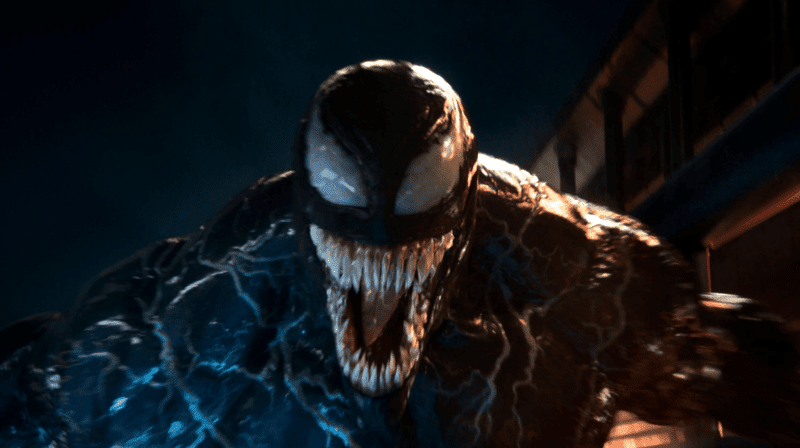 Considering VENOM is Sony’s first step into their own Spider-franchise, Venom’s misrepresentation in past films, and the large fan following the character has, there has been a lot riding on the film’s success. So how did it do? Here’s our VENOM review. WARNING: This VENOM review contains some spoilers for the film. VENOM’s plot is rather straightforward. Set in San Francisco, The Life Foundation is sending rockets into space. Run by its founder, Carlton Drake, the Life Foundation awaits one of their rockets, coming back to Earth from a recon mission. 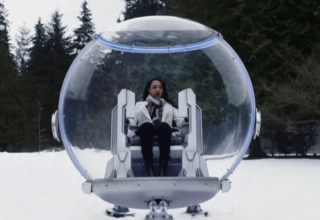 It brings with it five living and sentient organisms from space. Drake (Riz Ahmed) sees these symbiotic organisms as a means to advance and evolve the human race. 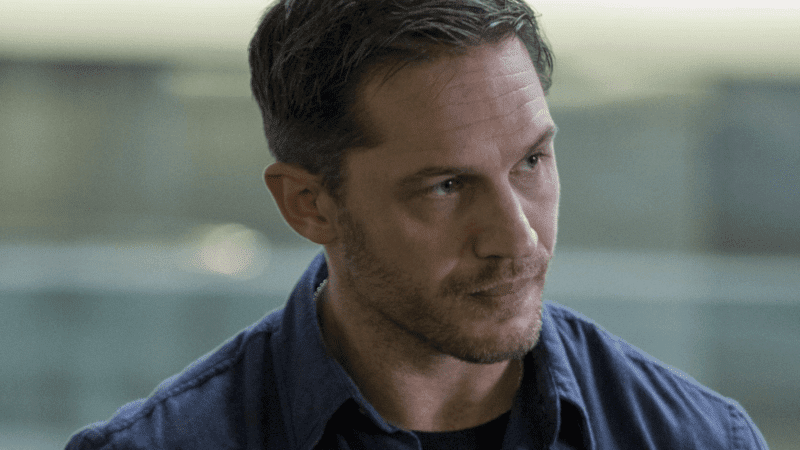 Investigative journalist Eddie Brock (Hardy) looks into Drake’s shadier exploits and consequently loses his career and relationship. Months later, Eddie comes into contact with a whistleblower at the Life Foundation. She claims that Drake is using the homeless as test subjects for his symbiotes, killing them in the process. Eddie goes to the Foundation late at night, hoping to get evidence and get his life back. Once there, he inadvertently bonds with the symbiote known as Venom. After escaping, Eddie finds that his body is now home to Venom. Together, they evade Drake’s men. They make a deal: Eddie cooperates with Venom, and Eddie might survive. 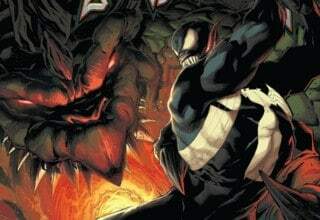 However, over time Eddie and Venom end up finding common ground and work together to stop Drake. There’s more to the film’s climax and conclusion, but for the sake of not spoiling the film, I’ll leave it at that. I found VENOM’s plot to be fairly basic. There is nothing super dynamic or eye-opening. It’s pretty formulaic from start to finish. 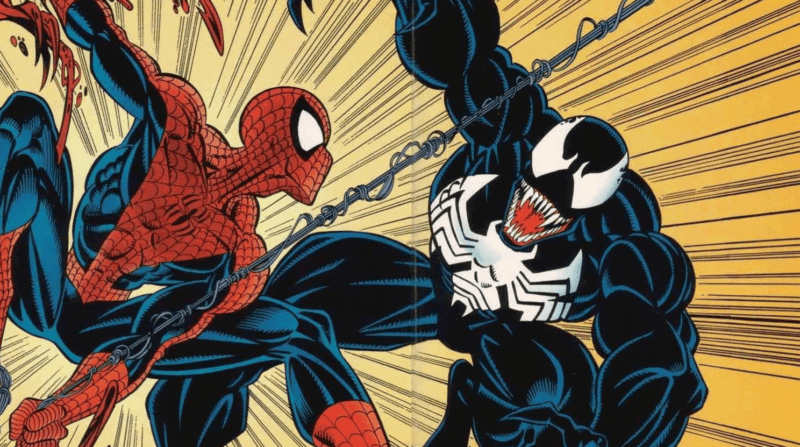 Some may justify VENOM’s plot by arguing that it’s an origin story. 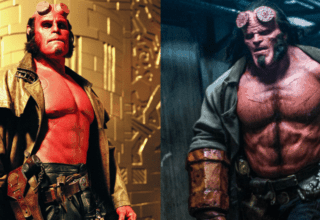 The formula is to be expected in this day and age where we’ve seen so many superhero origin films. For this VENOM review, I’m going to disagree. Origin films can still be engaging and surprising, provided with enough creativity. 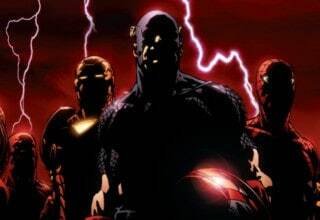 Even from the CAPTAIN MARVEL trailer, I can tell that it will have a better origin story by the simple fact that the titular protagonist herself will be learning her origins alongside the audience due to memory tampering. Regardless, VENOM’s plot is straightforward and predictable. I’ll say it right here: Tom Hardy’s performance is the best part of this film. Even with the plot being what it is, Tom Hardy gives his all in every scene. His first moments bonded with Venom are perfect. It’s exactly what you would expect a person to act like if an alien symbiote took control of their functions. Eddie Brock’s character arc works notably well. At the film’s start, Eddie has little interest in helping others after he loses his job and girlfriend Anne (Michelle Williams) after interviewing Drake. 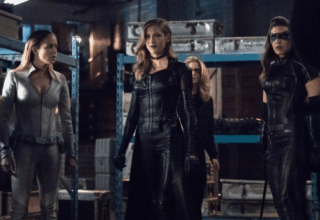 However, after bonding with Venom and discovering more of Drake’s plans, they choose the heroic option and go to stop Drake. Venom has a similar arc. When first bonding with him, Venom only sees Eddie as a means to get back on a rocket to rejoin his fellow symbiotes. However, after spending some time on Earth, he decides that he likes it. Venom sees a kindred spirit in Eddie beyond the fact that he’s just a good host. What’s cool is that Venom’s arc is still focused on his desire for self-preservation. While he says he likes Eddie and Earth, he also sees an opportunity to be better than he was with his own kind as he admits that he was a loser, like Eddie. All of this being said, I do have some light problems with both of their characters. It seems like the only reason Eddie’s an investigative journalist in the film is because he was in the comics and it works for the plot. He doesn’t really act like he has the intelligence for it, having more of a jockish, jokey personality. He doesn’t really do a lot of the problem solving, letting Venom take the lead most of the time. It would have been nice to see Eddie provide alternate methods to achieve goals due to smart, critical insights. Seeing Eddie trying to convince his savage other-half would have been really entertaining. Instead, Eddie’s attempts to control Venom are limited to him telling Venom he can only eat bad people. What results is a quick synchronization of man and alien where one would perhaps expect some more tension at the onset of the relationship. Venom’s change of heart, while still continuing his selfish arc while doing a heroic deed, is awful quick as well. There definitely needed to be some more character beats for him to get to that point in a more organic fashion. Now, the trade-off of less conflict is that Eddie and Venom hit it off pretty quickly, with minor moments of quick tension. This means that the film has plenty of time for the two of them to interact to very humorous effect. 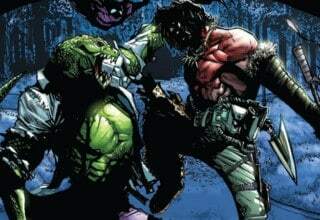 Venom telling Eddie to quit embarrassing him or Eddie explaining to people he has a parasite, to Venom’s large offense are just a couple examples. Eddie’s initial discovery and subsequent bodily reactions that he has a symbiote inside of him is super funny. Whether its’ Eddie looking into the mirror, seeing Venom’s face and shrieking, ravenously eating tater tots, or hearing Venom’s voice in his head, it’s all hilarious. I cannot stand Carlton Drake. So many of his scenes and lines are essential attempts to make him more dimensional and perhaps even sympathetic, but none go far enough to actually succeed. 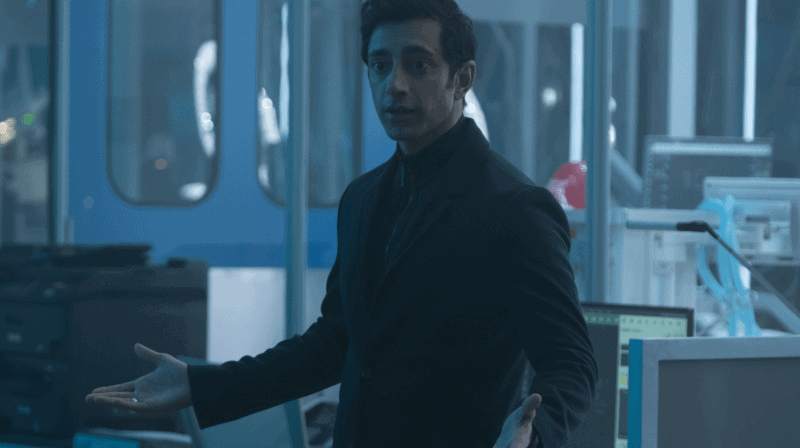 It’s disappointing, as I really like actor Riz Ahmed, and it looks like he attempted to give a good performance. However, there’s only so much you can do when the material is weak. Without spoiling too much of the ending, Drake’s supposed motivation is to combine man and symbiote in order to help heal human conditions and illness. He also sees symbiotic bonding as a means for humans to live on other planets. However, near the film’s end, he completely throws those goals away for no reason. Drake’s personality weirdly changes, going from a Thanos-type do what’s necessary to save the masses attitude, to your typical angry mad scientist. It’s really strange. 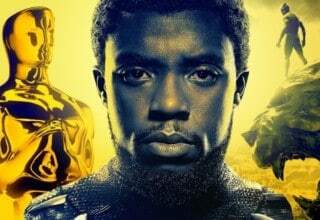 He’s not memorable in any other regard, and his fate at the film’s climax doesn’t feel earned. Another problem worth mentioning in this VENOM review is the fact that VENOM doesn’t pick a lane in terms of its tone. Is it an action film? A horror? A comedy? A romance? 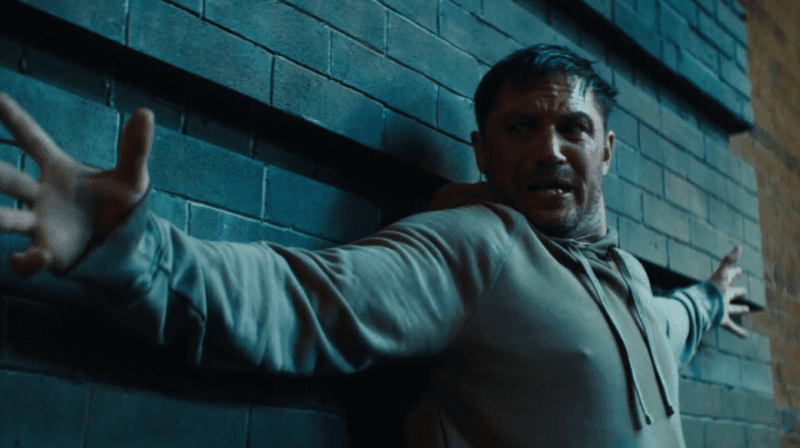 VENOM has a foot in all of those doors, and the result is some pretty disjointed scenes across the film’s already sub-par narrative. In terms of tone, I feel as though VENOM would have benefitted from going all in on the horror aspects. The man desperately trying to control an alien savagery within him, until finally yielding to the darkness. To do this, I also think that VENOM should have held on to an R-Rating, as I feel that the subject material naturally earns such a rating. 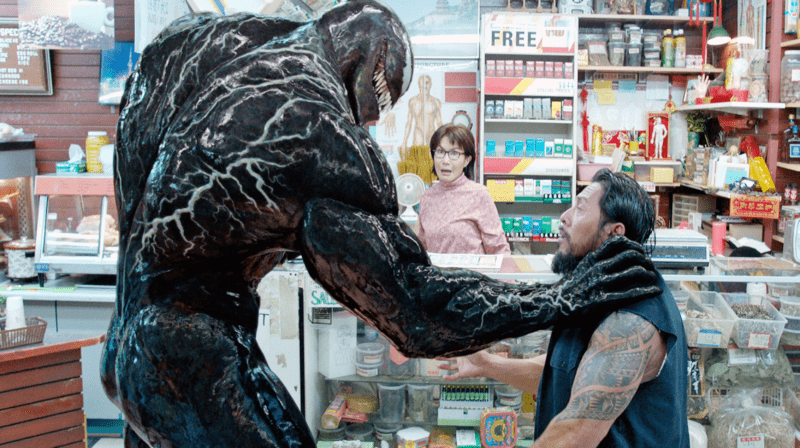 The ability to spend more time visually on how Venom fights (ripping off heads and eating people) would have given the film a stronger horror/monster tone overall. All in all, VENOM is a fun film. The character/s that makeup Venom are reasonably good and this depiction of Venom is the best version to have appeared on the big screen thus far. Yes, there are problems. The plot is thin, the bad guy’s boring, and the film has some tone and minor character issues. However, I would still recommend seeing VENOM. Tom Hardy does a wonderful job, and seeing Venom on the big screen is a sight to behold, especially if you’re a fan. 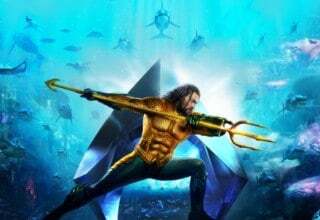 My hope is that Sony will take the better parts of this film, and continue with a sequel. 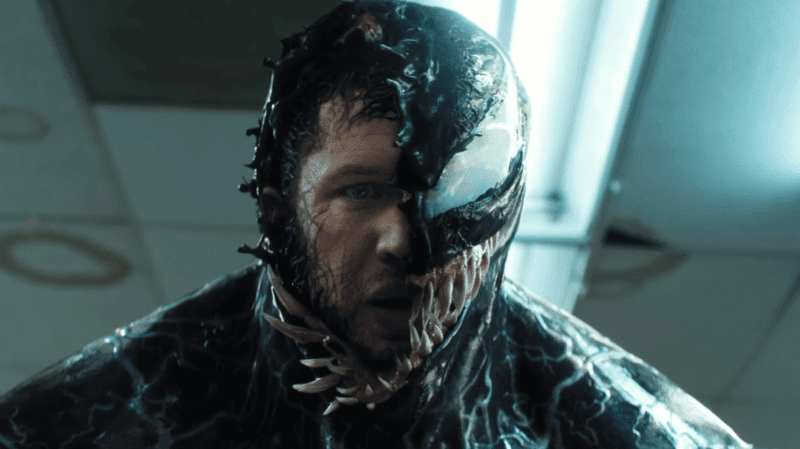 I think this film does enough to instill fans with the desire to see Tom Hardy’s Venom take on Tom Holland’s Spider-Man. Fingers crossed. Do you agree with our VENOM REVIEW? What did you think of VENOM? Let us know in the comments below! 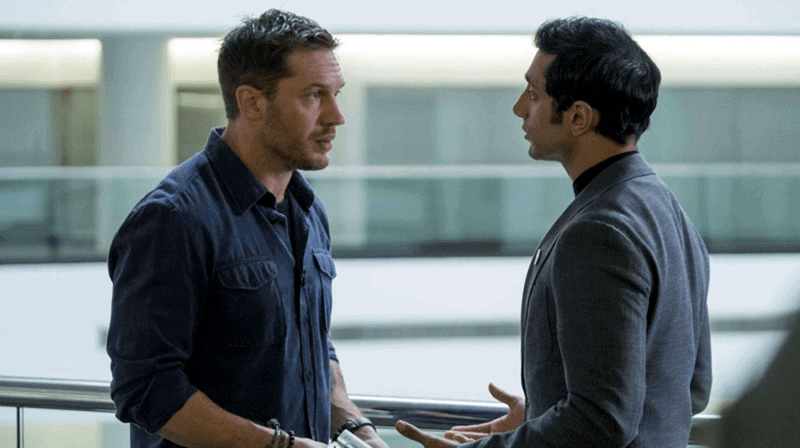 VENOM is in theaters now starring Tom Hardy, Michelle Williams, and Riz Ahmed.